I’m a newsletter writer with monthly subscribers. I just charge my monthly subscribers more money. Now, to make $5 billion I would need 137 million subscribers – just like Netflix (NFLX-NASD). That’s what they did recently increasing their fees by $3/month on their 137 million subscribers – for a total of an extra $4.932 billion a year… each and every year. In Year 2 you’re $10 billion ahead; in Year 3 it’s $15 billion extra cash. Pretty soon you’re talking real dollars. Now, believe it or not, there’s good news AND bad news to this. The Bad News is that we are not the first people to figure out that there’s a lot of easy money in this business. Disney figured this out, as did Amazon, Facebook, Hulu, Comcast, Viacom and a host of other billion-dollar entertainment companies. The Good News – especially for investors in the company I’ll disclose on Wednesday – is that everybody wants to be Netflix now… and who can blame them? They all want to be able to earn a quick & easy $5 billion with their own streaming services – and are moving in that direction fast. As a result, groups like Disney are pulling their content from 3rd party streamers like Netflix and starting their own streaming platforms. This means that now – more than ever – Netflix and all the other copycats – they need content; quality content. If at all possible, family content so the kids demand to subscribe year after year. Want to hear the VERY GOOD news? I think I’ve found the next PIXAR. Seriously. I will be stunned if you don’t agree with me after I tell you who it is. Major studios & streaming companies already ASK THEM to do shows for them. They’re already at The Table with The Big Boys. I’m not kidding – I could go on. This company is in the cat bird’s seat for one of the biggest capital spends the world has ever seen. They’ve shown they can make money – really good money – doing it. And their timing is impeccable. That’s why I’m long. But now – everybody else is getting even. Copycat services are starting up, and many of The Big Studios are pulling their content to start their own Netflix-style service. That’s not just Good News – it’s VERY VERY GOOD NEWS… because you know what means? They all need high quality content! Demand is rising… especially for high quality content. You know what happens when demand goes higher? Prices go higher. These companies are now spending billions of new dollars in a race to find The Next Big Binge-Watch. The appeal of the Netflix subscription business model is obvious. It is a huge recurring cash flow stream… big enough to attract these enormous companies and their absurd purchasing power. 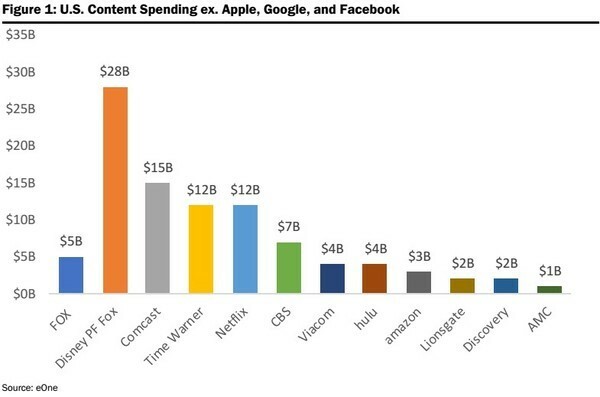 The billions spent on content has been steadily rising for years now, but even this massive spending spree got a huge turbo-boost when Disney pulled its content from Netflix just over a year ago. Many… most actually… networks and Big Studios are starting their own streaming service. Every major studio and network wants their own flagship show like Breaking Bad or House of Cards – and they want to own the customer. That is making content creators The Kings of the global entertainment industry. So you won’t be able to watch Disney animation, Star Wars films, Marvel movies or anything else that Disney owns unless you subscribe through Disney itself. So not only is Netflix now facing the likes of Amazon, Apple, Google and others as competition… but it is also losing vital content from the likes of Disney who will also become a competing force. If you have young children, you know that Paw Patrol is a cartoon TV series that has dogs playing roles like police, fire, construction worker and recycler – all in different colors – and they rescue each other when they get into trouble. You probably don’t know that Paw Patrol has brought in as much as $300 million in annual merchandising revenues to its Canadian owners. CHA CHA CHA! That’s what can happen when a children’s program hits it with audiences around the globe – and it’s a bonanza for shareholders as well as the kids. To make that kind of Big Dough however, you have to own the Intellectual Property, or IP, behind the shows you make… and this small-cap content provider is keeping more of their IP than ever before. It certainly helps your negotiating position when The Big Studios invite you in and ask you to produce some their ideas – which is where my favourite small cap entertainment play is now. Disney bought Pixar in 2006 for $7.4 billion, after realizing they could not match Pixar’s high quality content. It ended up being a HUGE win for Disney, as the most memorable animated movies in the coming years – like Lion King – came with Pixar management at the helm of Disney animation. This team is very focused on creating an animation blockbuster. They have ex-Pixar people on staff. How long until they create the next global blockbuster that sends this… really, it’s a micro-cap… into a household name around the world? I mean, this company already has a potential backlog of $170 million in projects with Tier 1 content suppliers, but if they develop another Paw Patrol and get some $300 million in just one year, just from merchandising… this stock rocks. DO NOT MISS MY NEXT EMAIL!!! In my next e-mail I will show you where I have put my money – the stock through which I intend to take advantage of the desperate scramble to secure entertainment content. I’ve always said — one of the best ways to make money in the markets is to find the smallest company in the best play. Right now entertainment has one of the largest tailwinds of any sector in the world. 5 – The very good reason why I believe that this company is the next PIXAR – a grand slam homerun global entertainment business. Like I said at the top of this story… I can show you how to make $5 billion very easily. But the guy who really will do that… will have to go through this company. And he will pay. You will find out all of the reasons why I’m long… and I can’t wait to tell you the full story on Wednesday.